A prominent minimalist sculptor (and amateur magician) once characterized art as a kind of “magic trick.” Employing language that is likewise as inflammatory as it is illuminating, an eminent literary scholar (and sometimes art historian) contends that art and literature operate according to the logic of the “gimmick.” Artist (and practicing architect) Brian Zamora agrees, developing these and other insights about the nature of art, illusion and technology into a striking body of work titled New Lighting Devices. 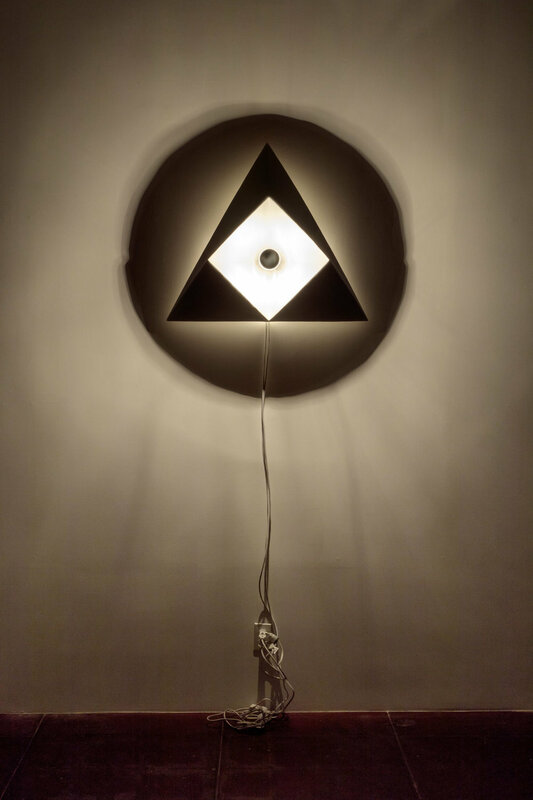 Each of Zamora’s medium-sized, wall-mounted sculptures consists of a foam or wood element precisely machined and finished into an ambiguous—that is to say, not readily identifiable—form, in the center of which is mounted a single light bulb. The leading edges of each piece shape the crisp shadow its light source casts on the surrounding wall. But, unlike the more complex sculptural form that shapes it, the seemingly disembodied shadow is easily identified as one of a number of simple geometric configurations: circle, square, triangle, etc. The visual contradiction is momentarily disorienting. And this, along with the flash of recognition that soon follows, is arguably the essence of the art experience the work provides. If so, then Zamora’s artworks leap past their most obvious points of reference in the California Light and Space movement of the 1970’s and go back even earlier to Op Art of the 1960’s, recovering, as he has here, the kind of direct, pre-critical and frequently perplexing psychological and physiological experiences Op Art once offered.